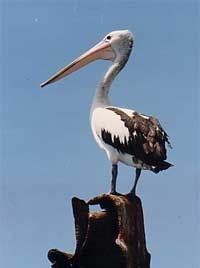 The ubiquitous Pelican is found all over Australia and Tasmania wherever a suitable habitat of estuaries, rivers, lakes and mud-flats occur. 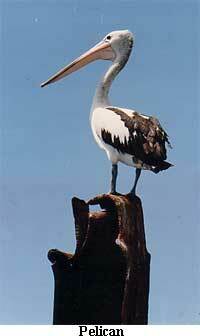 This species breeds in colonies in inland swamps and sometimes on islets off the coast of Australia. The nests are slight hollows scraped in the ground often three or four feet apart, with little or no herbage around. As many as l50 to 200 nests have been seen in one colony. Small fish is the main diet, though shrimps and prawns are also consumed.